The 2-Day Leadership Training program is geared towards advancing leadership skills with managers, supervisors and key employees for small to large organizations. The leadership program focuses on how leaders can best accomplish company goals within their organization through employee workforce engagement. Participants will greatly improve communication skills with co-workers and customers, and learn how to best build and enhance a team. Participants will practice proven ways to strengthen leadership skills and how to optimize performance from the people they lead. The leadership series is a total of 16 hours of training. The program maximum is 24 participants. Print the full PDF Program Description below. Learn about the trainer for this course Jeffrey Benjamin. I recently attended Jeffrey Benjamin's Breakthrough Training. 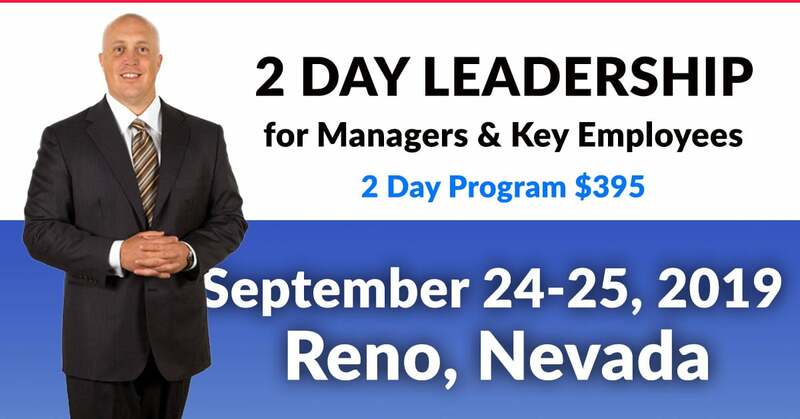 I have attended several leadership trainings over the years, and Jeffrey's two-day workshop stands out as among the best I've personally experienced. We were a mixed group of individuals who had never met before. We were required to self-organize in small groups to accomplish tasks that were challenging and unfamiliar. Participation was required from all individuals, which elucidated the different types of personalities and how we each find our place within an organization. I plan to send other members of my office staff to the workshops. Highly recommended! Jeff’s training was fantastic for all levels of Leaders. If you want to be a great manager/leader and you want to know more about your leadership style, this course is a must. His courses are designed to be very interactive and action packed! The team here at USAC had a great time, we had much needed team discussions, and we all left the 2-day training having FUN! I took Jeffrey Benjamin's Breakthrough Training Leadership modules and highly recommend it. I was able to get a lot out of them that I can apply in my professional career and in my personal life. Everybody wants to be able to communicate better with co-workers, employees, family members and friends. After completing the modules I felt that this was accomplished along with many other skills. I loved the Breakthrough Training! Thank you Jeff for getting me out of my shell and helping me find the skills I need to develop as a leader. If you have a chance to take this training, do it! Jeff's Leadership Program through his Breakthrough Training was a great resource and a really fun time for me. The information I learned was not only relevant to my work but also something that I could work on during my workday. Jeff was an amazing teacher/leader and would really delve into the conversations you wanted on the topics of the lesson, allowing you to lead the discussion. I had a great time and felt that the program made a large impact. The interactive challenges were definitely an eye opener for communication and leadership styles. It really helped me realize and work on approaching each style the most effective way to achieve goals. I had the opportunity to take Jeff's leadership class. It was wonderful! This class worked on team building and communication skills. I think this class would be particularly useful for anyone who is in a supervisory position or plans to be or in sales. It really helps to understand how to communicate with people you interact with in different situations. Jeff kept the class upbeat and was a wealth of knowledge. This was a real eye opener. Jeff is amazing at supporting you but also pushing you out of your comfort zone. His leadership training course prepares you to handle uncomfortable or difficult situations in life as well as improving your communication skills in public speaking. What a fantastic hands on training. Jefferey does a great job engaging the entire group and relating it to real life situations. I would highly recommend his services to anyone or any size organization. The group involvement makes the classes fun and enjoyable. Jeff has changed the way I run my business. I'm not only more confident in my communication skills, my ability to manage my team, to network effectively, but also how to strategically plan for the growth of my business. Breakthrough Training is an asset to our community and I offer my highest recommendation for Jeff's programs. It gave me the tools to address leadership, strategic planning, and establishing goals in both my personal and work life. If you invest your time with Jeff, he will teach you how to invest in yourself. This was not one of those death by power point trainings! The leadership training kept me 100% engaged, never got bored! I learned so much about my communication style and others, also the best ways to excite my team. Every company should look into this training for their team! I was really happy to learn about how to achieve goals. Having a guideline to get you there was extremely helpful. I now have it as part of my tool kit. It was great for me. The leadership series has been a great opportunity to return to the basics and really evaluate your interaction in group environments and to improve your communication as a leader. I immediately started applying what I learned from the class in life with friends, family and coworkers. It's amazing to learn how to communicate with other people. I thought is was going to be like a college course. It wasn't anything like that. It was more about getting involved in teamwork with 25 other people. It really helped me to apply that to both inside and outside of work. The communication styles has been a real eye opener in the way people relate to one another in your personal and professional life. I was a great experience for me. I really like Jeffrey's training style of interactivity. He is not in front of the class lecturing you. He really gets you involved in the process. I find I learn more that way so I can then take back and it practice in my business. Breakthrough offers a unique way to look at communication styles that we have been taught before, but gives us an opportunity to put it into action. This leadership course has provided me with the opportunity to get outside of my comfort zone, to network with multiple agencies, and to be able to distinguish the different personality types and how to address them in a professional manner. I recently participated in a session Jeff facilitated for a large group of high-growth entrepreneurs. Jeff's style was engaging, fast-paced, thoughtful and yielded terrific discussions on the disciplines and critical steps associated with successful leadership. I gained better communication skills and new leadership tools. I really learned how good communication is, not just in my professional life but in my personal life as well. It helped to hone leadership skills and communication styles. The program creates a safe environment to challenge fears in a fun way. It gave me the opportunity to break through fears and identify strengths. The leadership program has taught me valuable skills in communication and how to be a better leader with my co-workers and my family. I expected this class to be a typical leadership class where you are preached to. What this class does is teach you about leadership and how you can apply it in a business or personal setting. Jeffery’s training techniques in leadership were in depth and creative. His enthusiasm draws you in to be at your best in a management role in your company or running your own business. I learned in this class that to become a better leader you have to plan your tasks and set goals, and you need to get everyone on the same team. It has helped me in my business because I am making better decisions and it has improved my communications with customers. I really feel the course has helped me. Thank you for all of the past years of training, they are still being used (even in a new and completely different profession)! Jeff, you are the best! The training is done in a very straightforward, no-nonsense manner. His methods really make you think about what you want to accomplish, setting the right goals, the importance of teamwork, and how you can have a more confident, successful role in life. What we learned is that everyone plays a vital role. And as a leader, if we can draw on the strengths of others, we can create excellence. What I learned in this class was goal setting, teamwork, leadership and communication skills. I learned to lead by example. I was skeptical. I’ve done leadership classes in the past. I thought if you’ve been to one you’ve been to them all. I could not have been more wrong. It was an incredible experience. He helped keep me on course between a good business climate into one that was in serious decline. I am able to continue because of the methods, ideas and proceedures Jeffrey helped to develop. He is an excellent coach, motovator and innovator. Jeffrey's ability to challenge his clients and colleagues is superb; he is able to make them see their strengths and weaknesses easily through activities. The individual growth, focus and goal setting has been remarkable. Great experience for me. It has taught me quite a few things that I use in my life and at work. It has taught me things on goals and how to achieve them. By Day 1, Minute 10, the clarity, enthusiasm & sense of purpose that had eluded me for years, started to return. Jeffrey's ability to identify & lead people through mental roadblocks is amazing & his energy, integrity & set of core values permeates everything he does. Jeffrey puts together a wonderful Leadership program. It assisted me in the further growth of my own career. I would recommend his programs to anybody that is looking to grow in their life and career. I've learned a lot of valuable tools that I have been able to apply personally and professionally. One of the greatest ones I have been using is the communication styles to communicate more effectively with coworkers. Jeffrey recently lead our Management Team through a business development training course on teamwork, leadership, and communication. The feedback from my Management Team was extremely positive and will most definitely help strengthen our team dynamic. After taking the Leadership series I feel more confident and ready to become a leader. I highly recomend this course and think everyone should take it. You will learn so much about how you work as an individual and how you work with other people. I had the pleasure of attending his Leadership Seminar. I strongly recommend Jeffrey and Breakthrough Traning and highly suggest contacting him to see how he can make you better as well. Jeffrey Benjamin and Breakthrough Training are synonymous with great results. Jeffrey has the innate ability to push clients out of their normal thinking and help them excel towards their chosen goal. I have developed myself into an effective leader and use the skills I learned to help improve the company I work for. Jeffrey distinguishes himself with the ability to energize a group of people. Jeffrey's leadership training programs are an asset to any organization or group. He is attentive to detail and has a remarkable way of creating fun at the same. In the first hour of leadership training it was obvious to me that Jeffrey has been doing this for a long time. He is very comfortable leading a group and knows how to handle any situation that might arise. I highly recommend Breakthrough Training for not only a leader of a company but to all the employees of a company.